This image shows NASA's Mars Exploration Rover Opportunity (indicated by the arrow) perched on the edge of "Concepción" crater in Meridiani Planum, Mars. 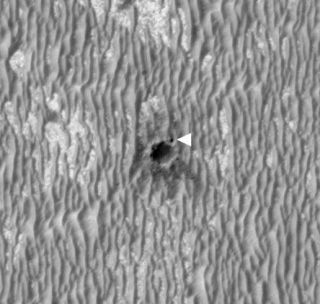 The image was acquired by the High Resolution Imaging Science Experiment (HiRISE) camera on NASA's Mars Reconnaissance Orbiter on Feb. 13, 2010. The dark rays seen emanating from the crater suggest it is a young feature. NASA's Mars rover Opportunity has found a Martian rockcovered in weird material as its odometer hit a major milestone this week, withthe long-lived robot completing equivalent to a half?marathon on the red planet. Opportunity, now in its seventhyear on Mars, found the odd Mars rock during the past six weeks studying investigatinga crater called "Concepci?n." The crater is about 33 feet (10 meters)in diameter, with dark rays extending from it, as seen from orbit, which madeit a target of interest for rover inspection because they suggest the crater isyoung. The rover made the pit stop to investigate the crater on itslong journey to the large crater Endeavour, which is still about 7 miles (12 km)away. It was while Opportunity was at Concepci?n that the rover surpassed 12.43miles (20 km) of total driving, about the length of a half-marathon. Opportunity has driven farther than any other wheeled robotto land on Mars. Its robotic twin Spirit, which landed in January 2004 justweeks ahead of Opportunity, has driven about 4.8 miles (7.7 km), while NASA?sSojourner rover, a small robot that landed in 1997, could only drive just abouta third of a mile (about half a kilometer) from the Pathfinder base it landedwith. With newsoftware that allows Opportunity to photograph rocks and other aspects ofthe Martian terrain and decide for itself what is worth closer inspection, therover took an up-close look at a few rocks ejected by the impact that created Concepci?n. What Opportunity has seen are chunks of the same type of bedrockit has seen at hundreds of locations since landing in January 2004: soft,sulfate-rich sandstone holding harder peppercorn-size dark spheres like berriesin a muffin. The little spheres, rich in iron, gained the nickname"blueberries." But these rocks have some unusual twists as well. "It was clear from the images that Opportunity took onthe approach to Concepci?n that there was strange stuff on lots of the rocksnear the crater," said Steve Squyres of Cornell University in Ithaca,N.Y., principal investigator for Opportunity and its twin rover, Spirit. "There's dark, grayish material coating faces of the rocks and fillingfractures in them. At least part of it is composed of blueberries jammedtogether as close as you could pack them. We've never seen anything like thisbefore." Opportunity used tools on its robotic arm to examine thisunusual material on a rock called "Chocolate Hills." In some places,the layer of closely packed spheres lies between thinner, smoother layers. "It looks like a blueberry sandwich," said MattGolombek, a rover science-team member at NASA's Jet Propulsion Laboratory,Pasadena, Calif. Initial analysis of the coating's composition does not showany obvious component from whatever space rock hit Mars to dig the crater, butthat is not a surprise, Golombek said. "The impact is so fast, most of theimpactor vaporizes," he said. "Thin films of melt get thrown out, buttypically the composition of the melt is the stuff that the impactor hit,rather than the impactor material." The composition Opportunityfound for the dark coating material fits at least two hypotheses beingevaluated, and possibly others. One is that the material resulted from partialmelting of blueberry-containing sandstone from the energy of the impact.Another is that it formed from filling of fractures in this type of rock beforethe impact occurred. "It's possible that when you melt this rock, thesandstone melts before the blueberries do, leaving intact blueberries as partof a melt layer," Squyres said. "As an alternative, we know that thistype of rock has fractures and that the sandstone can dissolve. Long ago, waterflowing through fractures could have dissolved the sandstone and liberatedblueberries that fell down into the fracture and packed together. In thishypothesis, the impact that excavated the crater did not play a role in formingthis material, but split rocks along fractures so the material is exposed onthe exterior like a coating." Golombek said, "One consideration that jumps out isthat we've been driving around this part of Mars for six years and never seenthis stuff before, then we get to this young crater and it's coating rocks allaround the crater. Sure looks like there's a connection, but it could just be acoincidence." The observation that the rocks thrown from the crater havenot yet eroded away much is evidence that the crater is young, confirming thesuggestion from the dark rays. "We're not ready to attach a number to it, but this isreally young. It is the youngest crater we've ever seen with Opportunity andprobably the youngest either rover has seen," Squyres said.